I woke up this morning, intent on taking our dog Saki out for an early morning run. The days are getting longer, it should be sunny out earlier, no big deal, right? Nah. It was dark as hell outside. And, as I’d started gathering the things I needed for exercising in the dark, I realized I’d never written about exercising outdoors in the dark. I’ve written before that I’m someone sensitive to issues of security and safety, and that’s because I’d been kidnapped before as a kid. I spent years writing about those issues and mentally working my way through them for my own well being, and one of the ways I had to work through that was accepting that I’d always need to keep a close eye on matters of safety. I’m okay with that. That also means I give great advice on how to stay safe but still get the job done. 1) Wear as much bright and/or reflective gear as you possibly can. I blogged about these Asics shoes a few years back because they were branded as “glow in the dark” and I was really excited about that, but I didn’t get it then. These shoes have a special material that we refer to as “3m” that reflects light as it hits it. See the jacket I’m wearing above? It’s also the same jacket in the photo below. 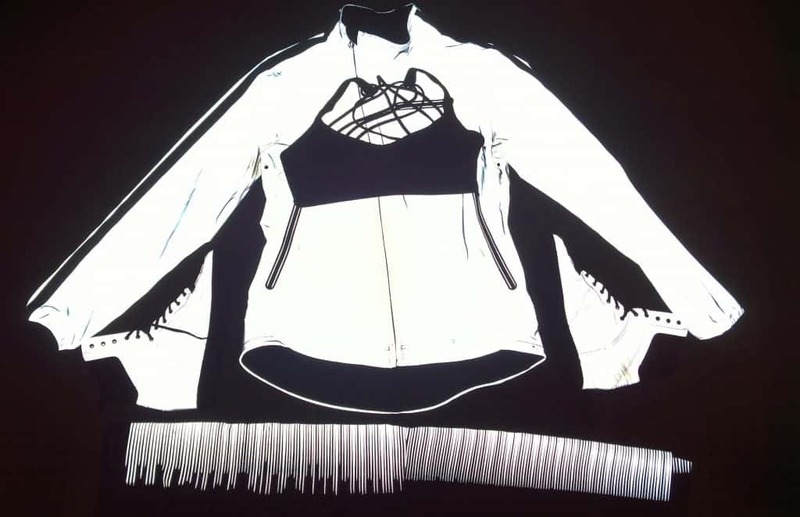 In that photo is my jacket (with a regular strappy black sports bra laid across the top of it), a pair of black Nike tights with 3M detailing down the leg (across the bottom), and a pair of boots (along each arm of the jacket) that are all completely 3m material. That’s precisely how bright the material is when the light catches it in the dark. If you’re going to be out jogging near a path with lots of cars, their headlights will catch the shape of your 3m or neon bright gear, signaling to them that there’s a person there to watch out for. This is especially helpful for when you’re out in areas with no sidewalks. 2) Only take familiar routes at night. It should be a route you know back to front. You should know if there are any alleyways or dark streets or ditches or potholes or seedy bars or wooded areas or anything that could pose a risk to you getting to and from your chosen destination safely. Your ideal route would be well-lit, frequently patrolled by law enforcement, fairly busy (a car every ten minutes or so would be ideal), have few alleyways or wooded areas. Many crimes are merely crimes of opportunity—we want to ensure that we don’t look like “an opportunity” to any ill-intentioned scumbag. As a side note, if you’re traveling, use apps like MapMyRoute which crowdsource popular routes for your location. Search the web for run groups in the area. And always make use of your hotel concierge, asking for insight into the best run paths. It might require a cab to get there, but if it means a beautiful view and a great time, it might be worth it. Moreover, don’t carry your entire wallet. In fact, if you can avoid it, don’t carry any of your credit or debit cards. My personal photocopy of my ID doesn’t even have my address on it—I blacked it out. Need my address? Call my emergency contact. They’ll give it to you if you need it. 4) Create an exit strategy. If you live in an area where you can’t get an Uber/Lyft/Gett/[insert car-sharing service] quickly (I can’t imagine how at this point), carry cash just in case you need to flag down a cab and get somewhere fast. Nah, I’m not kidding. That’s me and my pepper spray. The Sabre RED Pepper Spray for Runners (Click here for my Amazon link!) 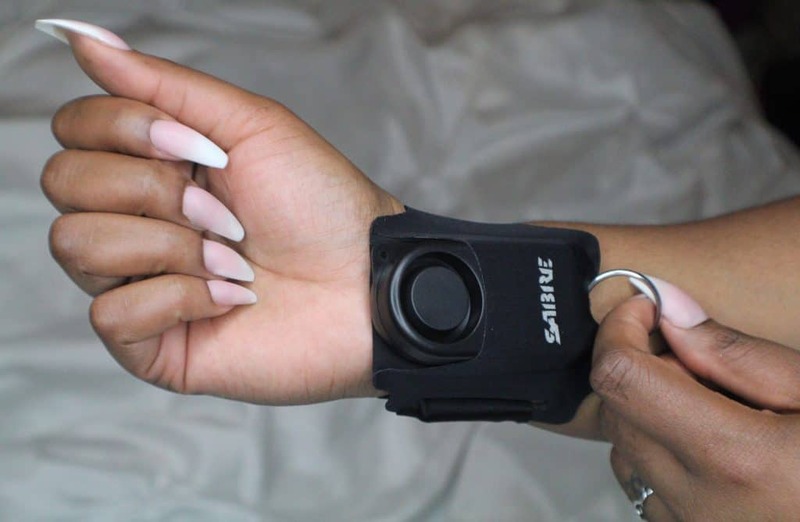 comes with a strap that velcro–wraps around your hand so that you don’t have to spend your entire time out with your fist clenched holding onto your spray. It also has a button that won’t spray unless you rotate it, a motion that you can easily do with your thumb alone. 6) Know the rules of headphones outdoors. First, no headphones. If you’re like me, though, this makes exercise brutal. So, if you’re going to ignore that rule and use headphones anyway, get ones that aren’t noise cancelling. (My beloved Bose sport headphones would be a bad idea, here.) Ear buds with grips that keep them in place are convenient, but the kind with an earbud that isn’t perfectly shaped to your ear will be the kind that let in the most sound, helping you to hear what’s around you. 7) Let your loved ones know where you’re going and when, and use your smartphone to do it. Apps like Companion: Mobile Personal Safety do a great job of sending your “companions” a link with GPS enabled so they can track your location, whether they have the app installed or not. The app also intermittently checks in on you—if you don’t respond, it alerts your companions that it might be time to check in on you. It also has a button that quickly lets you contact the police if you feel like you need assistance. 8) Don’t just scream—ring the alarm. If someone is closer behind you than you’d like, don’t be afraid to pull over and pretend to be going through your phone. If they try to run up on you, scream… or, in my instance, pull your personal alarm. No, really. This Runner’s Alarm (again, from Sabre) sets off a 130db alarm that will alert anyone within around a quarter mile’s earshot that something is going down and will likely freak out your attacker so much that they will flee the scene. 9) Take self-defense classes. Not because you need to know how to beat the living hell out of someone, but because you likely need the mind shift that comes with being trained to fight for your life. After taking self-defense classes like krav maga or kickboxing, your mentality shifts. Your response to attack changes from “shock” to “DESTROY,” and that’s important. It’s one thing to believe it’s easier to just hand over your wallet or other things you have on you, and I actually agree there. But the world has changed a lot in the last few decades, and we have much more to be concerned about than mere robbery. * Let’s just look at it as another weapon in a fully-stocked arsenal to be able to put up a fight in the war on violence against women. 10) Stay on high alert of others. Jog against traffic so you can always see them coming (and they can see you.) Never walk up to a car (or van!) asking for directions. Always keep a special eye on people who are in a location where people don’t belong. Person standing on the side of the road with no car in sight? Person lingering on the train platform after having let a train pass without getting on? Never be afraid to ask yourself, “why would this person be here?” If you can’t think of a good reason, it’s okay to avoid. As someone who manages to “fit it all in” by waking up earlier and going to the gym or going to the gym late at night, I’ve had to work hard to make the dark hours my best friend. These little bits that I’ve picked up are great ways to not only help reduce the risk of danger, but prepare you for it should it arise. Before too long, you’ll be grabbing your bag and heading out in the wee hours of the morning, too! Bonus tip: Adopt a big slobbery pit bull like my Saki from your local shelter, and watch how fast the sidewalks and streets! clear up when you come through. People cross the street when they see this big 80lb puppy come barreling down the sidewalk, and that’s just the way I like it. *It’s really hard to suggest that we learn self-defense tactics to combat danger without it seeming like one is implying that it’s a victim’s fault for not using these tactics if he or she is attacked. No one is more clear on that conversation than me. That being said, I do believe it is a necessary form of training—especially for people like me who’d been harmed before and needed to feel empowered to get out there again. I live in Florida, in a “safe” suburban neighborhood with two cul-de-sacs and only one way in and out. As a former New Yorker I’m always looking over my shoulder even in daylight. Sometimes I’ll walk around dusk and my guard is always. You never know. 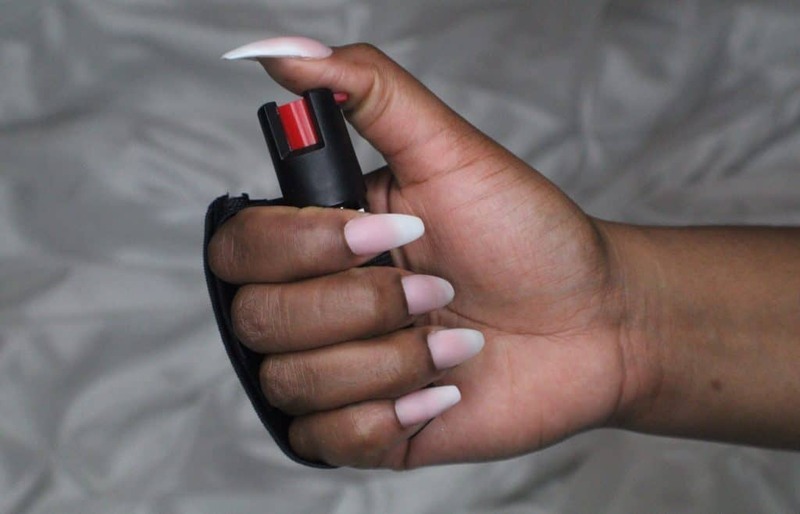 I’ve been wanting to get pepper spray so thanks for the reminder and the links. Thanks for sharing this article. I am not a morning person and usually I end up lazying around at night. Your tips are great and all the more motivating. Can’t wait to start my exercise routine from tonight itself.